Beth and I had Sensational Kids on Wednesday. I reported to Rod that Beth had been going well in her ‘Disney’ room at school up until Tuesday when she had had a very defiant day, refusing to go to either class or in her Disney room. No idea still what the issue is. Once again it showed me what a supportive school we have, Beth’s aide had come out to speak with me and to reassure me that it wasn’t a problem and they would sort it out. She seemed to go back to school on Thursday morning ok, she dropped her bag in the classroom and was chatting with her friends when I left. In our speech session on Wednesday Rod started off with a tug and war game to rev Beth’s engine up. We discussed Beth’s role in JRock so Rod decided that Beth could write and direct a play. Beth was in fine form this week and worked well with Rod and I. She called her play “Uni Uni Uni, look Buzz, an Alien.” Rod told her that the play couldn’t be from a movie or book so Beth combined characters such as Buzz and Woody from Toy Story, Hercules, Zhazhu (don’t know where from) and Timon from I think The Lion King. Buzz was in McDonalds and one by one the characters would see him and shout “Look Buzz, an alien” then laugh. Buzz wouldn’t think it was funny. Finally Hercules got the alien and showed it to Buzz, then they all laughed together. It was a nice play with a happy ending. Rod played the part of Buzz, I played Woody and one of the others and Beth played Hercules and the other character. She also had to direct us which she managed quite well with a bit of prompting. Rod said we would try it again in the next session with a more complex storyline. Here’s a picture of my in my Woody hat with the director. I look especially broad in my mumu but clearly the hat makes me look big. I should have asked – Does my bum look big in this? 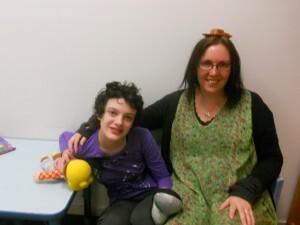 Beth’s session with the Occupational Therapist – Whiskas (not her real name) went well. They had made a collage for Beth’s friend Jessica for Beth to take to school to give her, it has all the things that Beth thinks Jessica likes. Besides that we’ve had a fairly easy week. Beth’s having next Tuesday off because the JRock rehearsals are on for the big production at Hisense Arena in the city. As we did last time JRock was on, I will take Beth in later in the day. It’s a huge day for all the kids, I have to drop my Bill off at school at 7.15am! He’ll be so tired that night. It’ll be well worth it though, the kids have a ball and such a sense of achievement. We’ll get a dvd of the performance so will put a copy on here for you all to see.